An Environmental Working Group investigation of government and industry data shows that EPA has failed to require public disclosure of pollution data under the Toxics Release Inventory (TRI) for at least 10 industrial chemicals that meet EPA's own criteria for classification as persistent bioaccumulative toxic (PBT) chemicals, a category reserved for chemicals that present the greatest threats to human health and the environment. One of these 10, di(2-ethylhexyl) phthalate (DEHP), was found in more than 95 percent of 2,800 people tested by the Centers for Disease Control in 2001 and 2002. Another, anthracene, was found in five out of ten fetal cord blood samples obtained by the Red Cross from US hospitals in 2004. Five of the ten PBTs identified in the analysis have been found in US tap water. Anthracene Anthracene was found in 5 of 10 umbilical cord blood samples from babies born in U.S. hospitals in 2004. Anthracene tests reported by public water suppliers show that 7,966 people in 4 communities drank water contaminated with Anthracene from 1998 to 2003. 1,2,4-Trichlorobenzene 1,2,4-Trichlorobenzene tests reported by public water suppliers show that 464,000 people in 45 communities drank water contaminated with 1,2,4-Trichlorobenzene from 1998 to 2003. 1,3-Dichlorobenzene 1,3-Dichlorobenzene tests reported by public water suppliers show that 14,000 people in 16 communities drank water contaminated with 1,3-Dichlorobenzene from 1998 to 2003. Chlorobenzene Chlorobenzene tests reported by public water suppliers show that 1.4 million people in 48 communities drank water contaminated with Chlorobenzene from 1998 to 2003. DEHP DEHP was found in more than 95 percent of 2,800 people tested by the Centers for Disease Control in 2001 and 2002. DEHP tests reported by public water suppliers show that 16.9 million people in 1,143 communities drank water contaminated with DEHP from 1998 to 2003. The public, particularly communities near facilities that pollute or dispose of these chemicals, needs comprehensive information on pollution or disposal with PBTs. Instead, EPA has proposed to limit public access to critical pollution information on these and other chemicals under the TRI. The Toxics Release Inventory is the nation's premier right-to-know law, providing pollution information on 650 industrial chemicals to communities nationwide. EPA's proposed rollback of the TRI would terminate reporting of all pollution and disposal information for 228,000 pounds of five PBTs at 123 facilities in 35 states. Ohio would be hardest hit, losing data on 22,000 pounds of hazardous pollutants at 14 facilities. Collectively, PBTs are the category of chemicals of highest concern to scientists and government regulators. They are among the few chemicals ever invented that have been targeted for global phaseout. The Stockholm Convention on Persistent Organic Pollutants, signed by the Bush Administration, bans or severely restricts 12 of the most harmful PBTs [Stockholm 2004]. PBTs constitute most of the chemicals banned in the U.S., including PCBs and DDT, and they are the industrial chemicals most likely to accumulate in human tissues, including babies in utero who are exposed when the chemicals cross a mother's placenta. Rather than curtailing public access to key pollution information on PBTs, EPA should maintain existing reporting criteria and expand their application to include detailed PBT reporting for the 10 toxic chemicals identified in this analysis. EPA needs to increase public disclosure of industrial pollutants that persist in the environment and accumulate in fish, wildlife, or humans. Environmental Working Group analyzed five industry and government datasets containing more than 1.5 million test results for hundreds of high production volume chemicals. The investigation identified 10 industrial chemicals that should be subject to increased reporting under the federal Toxics Release Inventory (TRI) program because they meet the agency's own criteria for classification as PBTs. Eight of them are high production volume compounds produced or imported in quantities greater than 1,000,000 pounds at least one year between 1994 and 2002. Inclusion of these 10 in the list of chemicals subject to the Agency's stringent PBT reporting requirements would represent a 50 percent increase in the number of PBTs currently tracked by the TRI. Five of the 10 chemicals identified by EWG as meeting PBT criteria are subject to pollution reporting under TRI. But these same five chemicals are not subject to TRI's comprehensive reporting required of the Agency for PBTs. If these five were correctly classified by the EPA as PBTs, industry would report, and the public would have access to, substantially more detailed information on pollution and disposal for these chemicals at at least 103 facilities in 32 states. For example, when EPA required more stringent disclosure for 20 PBTs in 1999, total reported pollution and disposal increased by almost 50 percent. For heavily used or highly toxic compounds like lead, mercury, and dioxin, reported emissions increased from 30 to 80 percent. Environmental Working Group, compiled from Toxics Release Inventory data. Five other PBTs identified by EWG are not currently subject to TRI reporting requirements at all, even though they are clearly toxic and are used in enormous quantities by industry, ranging from one million to 500 million pounds per year. Eight of the 10 PBTs identified were manufactured in or imported to the U.S. in quantities of one million pounds or more in 2002, EPA's most recent year of record [EPA 2002a]. Toxic chemicals that persist and bioaccumulate are of particular concern because they remain in the environment for significant periods of time and concentrate in the organisms exposed to them. Lowering the reporting thresholds for PBT chemicals will ensure that the public has important information on the quantities of these chemicals released or otherwise managed as waste, that would not be reported under the 10,000 or 25,000 pound per year thresholds that apply to other toxic chemicals. Under the TRI, EPA defines PBTs as chemicals that are toxic, linger in the environment, and bioaccumulate in living organisms [EPA 1999a]. 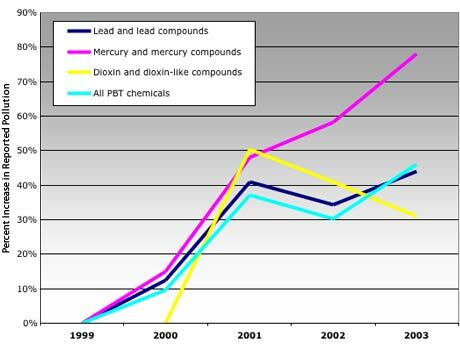 Many of the most hazardous environmental pollutants of all time are PBTs, such as DDT, PCBs, dioxins, mercury and lead. The TRI is the nation's premiere pollution reporting and citizens right-to-know program. It is widely recognized as the least controversial environmental program in the country and has been praised by industry and environmentalists as an effective way to increase chemical use efficiency and reduce waste and pollution. Established in 1986, the TRI imposes no mandatory pollution controls on industry, but instead requires the reporting of estimated levels of pollution and disposal for a list of 650 chemical compounds (less than one percent of chemicals registered for use in the U.S.). But this simple act of public disclosure has been widely credited with spurring voluntary pollution reductions, with total releases of all chemicals dropping by 65 percent since 1989 from among the program's 23,000 reporting facilities [Hogue 2005]. 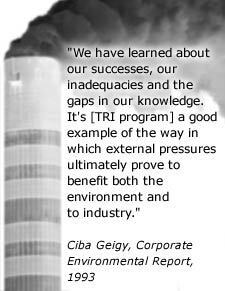 The TRI is the only source of chemical specific information on industrial pollution at the individual facility level. It is an essential source of information for state and local governments and community activists nationwide. Since reporting year 2000, the EPA has required special, stricter TRI reporting for 20 PBTs because of their inherent hazards. For these 20 chemicals and chemical groups, manufacturers and users of just 100 pounds, or in some cases far less that that, must report all pollution and disposal [40 CFR 372.28]. Lowering the reporting limits for PBTs has generated significant new information on PBT pollution. For all other chemicals, TRI pollution reporting is required only for facilities that handle at least 10,000 pounds a year or manufacture 25,000 pounds per year, and discharge or dispose of at least 500 pounds per year of the listed chemical. EPA's proposed changes include raising the reporting amount for all TRI compounds from 500 to 5,000 pounds of pollution or disposal per year, and cutting the reporting requirements from once a year to once every two years. Raising the reportable amount from 500 to 5,000 pounds would substantially reduce pollution reporting for at least five chemicals that are currently reported in the TRI and meet the EPA's definition for classification as a PBT, but are not yet classified as PBTs. The EPA's proposed rollbacks would eliminate all information on air and water pollution by these five PBTs at 121 facilities in 35 states. EWG's analysis provides only a partial list of high production compounds for which pollution reporting should be increased because they meet the government's own criteria for classification as persistent bioaccumulative toxic (PBT) chemicals. EWG was not able to analyze PBT properties for the vast majority of chemicals on the market because test data are not available. Testing is voluntary in spite of the well-established hazards associated with PBT properties. Clearly, many more PBTs exist where pollution is either not reported or substantially underreported. EPA's attempt to roll back reporting for all chemicals included in the TRI program will deprive communities of information on at least five major PBTs for which pollution data are available from no other source. PBTs are universally recognized as the one category of compounds for which increased knowledge, monitoring and regulatory vigilance are essential to protecting public health and environment. Instead of limiting the public's access to information on toxic pollutants, EPA should increase reporting of PBTs under the TRI by applying its current criteria to TRI chemicals that meet the PBT criteria, and by expanding the TRI to include PBT chemicals that are not currently reported under TRI at all. If past experience is any guide, vigilant application of existing criteria for pollution reporting with PBTs will produce significant reductions in pollution for many dangerous PBTs.